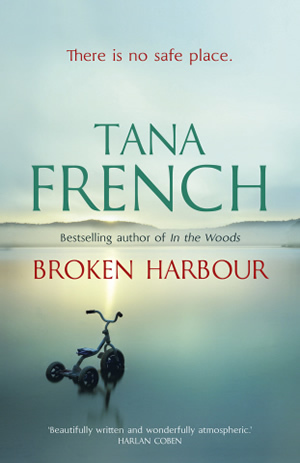 Broken Harbor is the 4th of Tana French's "Dublin Murder Squad" novels, each of which takes a secondary character from the preceeding book as the central character in the new one. This one features Detective Michael "Scorcher" Kennedy, along with his trainee partner Richie Curran. Kennedy, not quite back on his feet from a previous investigation that turned into a disaster (see Faithful Place) is sent out to one of Ireland's "ghost estates" when the Spain family is found, three murdered and one almost dead. All of French's novels have some common ground. They all feature adolescents in very important roles (current to the story and also in backstory). They are all psychological thrillers rather than mysteries, per se, or police procedurals (though police procedure plays a very important role in Broken Harbor). And in all of them, something in the central detective's past haunts him or her when the present investigation starts to deteriorate into disaster. 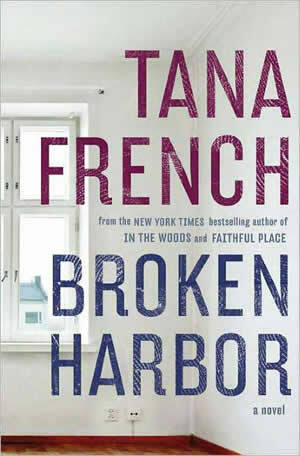 But what limits the impact of Broken Harbor, for me, can be seen in the book's contrast to the first and third of the series. In Faithful Place, the third, there's a lot of painful humor in the family relationship that haunts the main character (and the plot). The family is so true, and so truly horrible, that a reader's eyes are riveted to the story. In In the Woods, the first of the series, There is an abiding mystery in the detective's past that haunts the current investigation, and any solution seems tantalizingly out of reach. Broken Harbor has psychological trauma in abundance, but none of it so sharply drawn or darkly comic as the situation in Faithful Place. And there's plenty of weirdness and mystery (unexplained holes in the wall, lurking animals, stalkers, and more), but the author doesn't really exploit them for the full effect that she achieved in her debut novel. What pulls the story along briskly at first is a sense of a "real-time" investigation, as Kennedy and his colleagues move slowly, inch-by-inch through the preliminary investigation and the discovery of the strange details of the Spain's house and their assault. But after about a quarter of the book, the details of the story begin to be rehashed over and over by the detectives as they try to decipher what happened, and to me the dialogue gets a bit tiresome after a while. The pace and interest pick up again as Kennedy (the narrator) starts to point out to the reader the points at which the investigation starts to go wrong, and there are, indeed, some surprises along the way (in a particularly "Tana French" fashion, in a couple of cases, as people bring down disaster on themselves). The ghost estate is used very effectively in a couple of ways (and much more directly than in the several other recent Irish crime novels that have used the unfinished (never-to-be-finished) housing estates that fell victim to the financial collapse in Ireland. The crumbling estate, isolated on the fringes of society, becomes a psychological symbol as well as a social emblem. 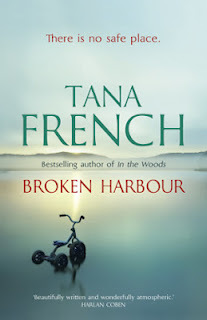 Broken Harbor is a good read, if a bit long, and the traumas of the crime victims and of Detective Kennedy himself are effectively drawn, But for me there's a bit of a spark missing, in comparison to what I still think is her best book, Faithful Place.